Singapore has a population of about 5 million while the number of practitioners in the financial advisory industry can be estimated to be about 20,000 to 30,000. This includes tied insurance agents, Financial Adviser firm representatives and banks’ financial services personnel. It is a considerably large number for our population size. How so? 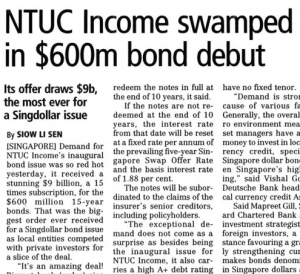 NTUC Income recently debuted its first ever bond issue of $600 million 15-year bonds which was open to the public and corporate entities. 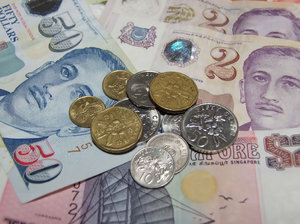 The coupon rate was 3.65% and NTUC Income has the option to redeem the bonds in full at the end of 10 years. Imagine having a doctor who purposefully does not treat you completely such that you would constantly remain sick, thus having to visit the doctor repeatedly, each time paying for his services and medication. 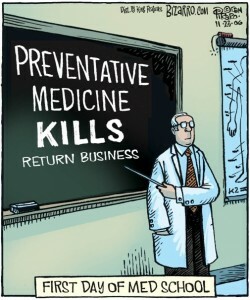 I am not familiar with the medical fraternity in Singapore and I trust that most doctors do their jobs ethically, but I know for a fact that the local financial industry thrives on this unethical practice. I recently met a client who bought an investment-linked policy recommended to her by her friend which provided poor coverage while being taxing on her monthly budgeting. What’s sad was what the agent wrote in the point-of-sale documents to justify the sale of the policy – an ostensibly apologetic “client to increase coverage when financially better”. It shows that the agent was fully aware that such a policy underinsures her client and yet deemed it fit to recommend her friend the policy. It is particularly upsetting since the client had specifically indicated her concern was (quite rightfully, for her profile) insurance coverage with her limited budget.